Many patients ask why they have to wait so many weeks in between each laser hair removal session. We get this question often from our patients at Inkfree, MD. Generally it is best to wait anywhere from 4 to 8 weeks in between treatments, with most averaging around 6 weeks. The specific timing depends on various factors, such as, the quality of treatment you receive, the area to be treated, your specific skin type and the particular hair growth cycle you are in. During this phase, the hair grows rapidly and contains an abundance of melanin which absorbs light. The hair growth in this phase lasts for a period of 1 to 6 weeks. The laser treats the Anagen hair. This phase lasts for a period of 2 weeks. This is the end of the growth phase and is marked by changes in the hair follicle. The hair stops growing and the hair follicle separates from the base, forming club hair. In this phase all activity stops. 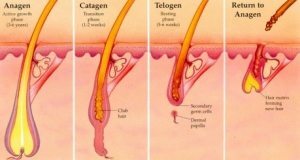 Telogen club hair remains in a resting state for 3 to 5 months before being released. The old hair is pushed out by the new hair, and thus the cycle begins.